Explore the sprawling city of Los Angeles with a German or English speaking tour guide on this small group tour. 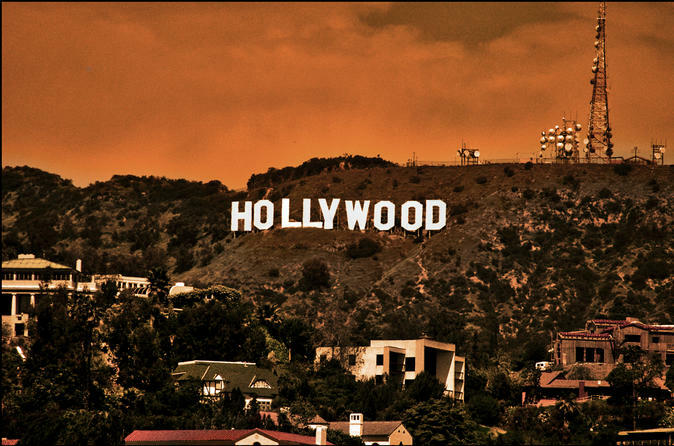 See the best of Hollywood, the Walk of Fame, Grauman’s Chinese Theater and The Dolby Theater. Also visit Beverly Hills, mansions of the stars, Rodeo Drive and the Sunset Strip in West Hollywood. Your tour continues through downtown Los Angeles and the Walt Disnsey Concert Hall, Staples Center, Nokia Theater and L.A. Live. You will also see the historical Bradbury Building, the Music Center and the Museum of Contemporary Art. You'll even visit Venice Beach and see the Venice canals, walk along the boardwalk to Muscle Beach and take in a wild mix of street performers, musicians and artists. On this tour you’ll be taken to the highlights of Los Angeles. We start out in Venice Beach, and the quaint Venice Canal Historic District followed by the Santa Monica Pier. We continue in Beverly Hills and marvel at multimillion dollar homes of the rich and famous. Celebrities, movie stars, and wealthy business tycoons call this area home. Keep on the lookout for your favorite stars--they might be close by! Especially when we pass by the 'platinum triangle,' composed of Beverly Hills, Bel Air and Holmby Hills. We will head to Rodeo Drive, one of the world‘s most exclusive shopping boulevards. You'll continue on to the Sunset Strip, Hollywood to visit the Walk of Fame and find the star of your favorite actor or actress from over 2,500 stars along the sidewalk. See the Dolby Theater (formerly the Kodak Theater), the Chinese Theater, the Roosevelt Hotel, Mulholland Drive, the Hollywood Bowl overlook and the Hollywood sign. Then, off to the Outlook to the Universal Studios passing by the Warner Brother studios and the Disney company all the legendary Film studios from Hollywood. Then, off to Downtown Los Angeles to see the city's roots, visit the first mission in Los Angeles, Bunker Hill, Union Station, Olvera Street, Chinatown, Staples Center and much more. We end our tour in Downtown Los Angeles at the LA Live. We are happy to arrange pick up and drop offs from your hotel.